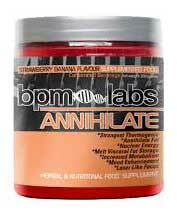 Annihilate is fat burning supplement manufactured in Queensland by BPM Labs. It’s produced as a powder and needs to be mixed with water and consumed as a drink. 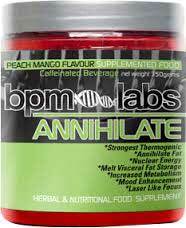 BPM Labs claim Annihilate is the strongest fat burner in Australia and state it is designed for any seasoned athlete who is hoping to “break his personal bests”. Claims like this make it pretty obvious the product is not intended for the average person who only needs to lose a little weight. BPM Labs also point out the formulation is not for the faint hearted or anyone who is “scared of stims”. So one thing is for sure: people who do not respond well to products that are loaded with stimulants would be wise to keep away. What is Annihilate and How Does it Work? Annihilate is a thermogenic fat burning product that derives most of its power from stimulants. Supplements that contain stimulants can be useful for speeding up the metabolism and helping people to burn calories at a faster rate. They may also promote thermrogenic fat burning, but many people do not handle stimulants well so Annihilate will be unsuitable for some users. All that extra stimulation should help power some better workout sessions though, and if the promise of improved focus holds true people who use Annihilate should find it easier to concentrate on their chosen workout activities. Taurine: A stimulant that is commonly used in energy-providing drinks. Caffeine: A popular stimulant that boosts mental focus and provides extra energy. Caffeine also has proven fat burning abilities. Eria Jarensis Extract: An orchid extract that appears to have value as an alertness booster and may also enhance the mood. It is sometimes used to replace DMAA (banned by the American FDA), but it has never been adequately studied. Cacao Plant Extract: Think cocoa instead of cacao and you will find this ingredient is pretty common. It provides a stimulant called theobromine that is not as strong as caffeine, but may help deliver a little extra energy. African Mango: A fruit extract. Further study is much needed, but the results of a study conducted at the University of Cameroon suggest supplementation with African mango enabled a reduction in waist and hip size. Nandina Domestica (Fruit) Extract: A shrub extract that contains a stimulant called higenamine. 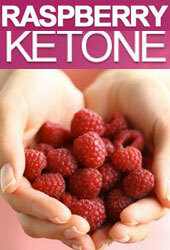 Green Tea Extract: A proven fat burner that can be found in any number of supplements. Thiamine: Also known as Vitamin B1, thiamine helps release energy from food. Bitter Orange Peel Extract: Provides a stimulant called synephrine that has a good reputation as a fat burner and is also good for providing extra energy. Niacin: Vitamin B3. Like thiamine, niacin aids the extraction of energy from food. It can also be useful for maintaining digestive health. Naringen: A flavonoid that can be obtained from grapefruit. It appears to have the ability to extend and amplify the effects of caffeine. Usage Instructions – New users are told to take just half a scoop of Annihilate and monitor for tolerance issues. The maximum dose is two scoops per day the drink is mixed by combining one scoop of Annihilate with 8-10oz water. It is important to stir the mixture well and it should be consumed on an empty stomach. Customer feedback is in limited supply. The feedback that is available suggests Annihilate may be good for providing a pre-workout boost, but a couple of people complain the taste is none too good. However, although interesting, the amount of feedback available at the time of this review was insufficient to provide an accurate picture of how well the product performs. Annihilate is unsuitable for anyone under 18-years of age and is not intended for pregnant or nursing mothers. People who have existing health problems should check with their physician prior to using the product. The same advice is offered to people who are using medication. If adverse reactions are experienced usage should be stopped at once. 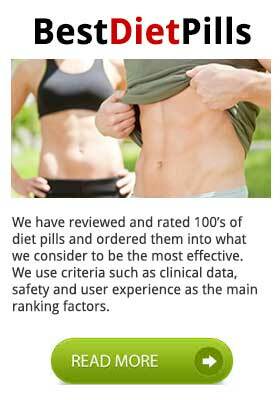 Annihilate is not available to buy from the manufacturer’s website, but the product can be purchased from a number of online stores including FatBurnersOnly.com.au and Nutrition Warehouse. The flavour choices are Strawberry Banana, and Peach mango. Each (350g) tub provides 50 servings and usually costs around AUD$ 70, depending on the chosen supplier and any promotions that may be in force at the time of purchase. Annihilate does not appear to be sold with a money back guarantee. Bearing in mind the amount of stimulants the formulation contains, Annihilate should be capable of providing users with a pre-workout boost, and it may be useful for bodybuilders hoping to get cut and lean, but it is not intended for use as general weight loss aid and should never be considered such. Many diet pills will provide better results without the risk of stimulant-related tolerance issues. 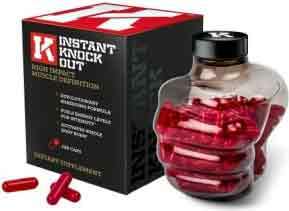 If you are looking for a pre workout supplement we strongly recommend Instant Knockout. It is a capsule based supplement (not a powder based supplement that you dink) that is arguably the best example of a workout supplement the world over. Instant Knockout was self developed by MMA fighters and contains a high level of researched ingredients.